A new millennium and a new force in filmdom. Dreamworks, a studio created only a few years back by Steven Spielberg, David Geffen, and Jeffrey Katzenberg would go on to win three consecutive best picture Golden Globes and Academy Awards. And 2000 was the year it won both Best Picture Drama and Comedy or Musical, a feat never equaled by any other studio. 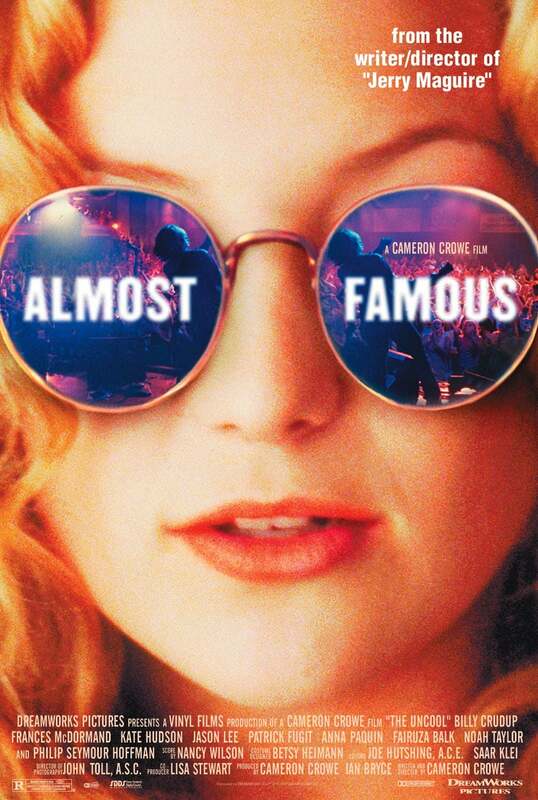 Almost Famous was Cameron Crowe’s last great movie following his Fast Times at Ridgemont High, Say Anything, and Jerry Maguire, which had earned him boy wonder status. Almost Famous was his most autobiographical film. It was the story of a teenage journalist aspiring to write for Rolling Stone magazine in the early 1970s. Crowe himself was a teenage writer for Rolling Stone. Despite winning two important Golden Globes (Kate Hudson won Best Supporting Actress as well) it was a box office disappointment earning less than its production cost. It was however critically acclaimed, Roger Ebert going so far as to call it the best film of the year, but the public wasn’t biting. The problem for them might’ve been the casting of Patrick Fugit, whom Crowe chose as his alter ego. He never seemed to connect with the public. Ironically, the rest of the casting was impeccable. Frances McDormand played his mother, Philip Seymour Hoffman, his publisher. Others in the cast, all unknown at the time, were Michael Ansara, Jason Lee, Zooey Deschanel, Fairuza Balk, Bijou Phillips, Jay Baruchel, Jimmy Fallon, Rainn Wilson, and Eric Stonestreet. Anna Paquin, who had already won an Oscar for The Piano, and Billy Crudup (as the elusive rock star) were part of the ensemble. But none of them were able to attract the intended audience. Fortunately, Dreamworks’ stablemate that year was Gladiator, which more than made up for Almost Famous’ losses by earning close to half a billion dollars worldwide. Also nominated that year for Best Musical or Comedy were Best in Show, Chicken Run, Chocolat and O Brother, Where Art Thou?. The Golden Globe for Best Actor in a Comedy or Musical went to George Clooney for O Brother, Where Art Thou?. Other nominees were (perennial) Jim Carrey for Dr. Seuss’ How the Grinch Stole Christmas, John Cusack for High Fidelity, Robert De Niro for Meet the Parents and Mel Gibson for What Women Want. The Golden Globe Best Actress in a Comedy or Musical was Renée Zellweger for Nurse Betty. Her competition: Juliette Binoche in Chocolat, Brenda Blethyn in Saving Grace, Sandra Bullock in Miss Congeniality and Tracy Ullman in Small Time Crooks. Highlight of the evening: Bob Dylan accepting his Golden Globe for Best Song, “Things Have Changed,” which he composed for Michael Douglas’ Wonder Boys. The other nominees that year were: “I've Seen It All” from Dancer in the Dark, "My Funny Friend and Me” from The Emperor’s New Groove, “One in a Million” from Miss Congeniality, and “When You Come Back to Me Again” from Frequency - as poor a year as has ever been, saved by Dylan’s Nobel prize-winning genius.